INTRODUCTION This is a standalone DC voltage meter. It measures 3V-30V with 1% accuracy. Best suited for battery level display. Just apply two wires on the power without any extra circuit or components, it gives the reading straight away. 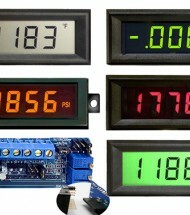 Easy to use, and is a good company with robotic ..
INTRODUCTION This is a standalone DC voltage meter. It measures 2.7V-30V with 1% accuracy. Best suited for battery level display. Just apply two wires on the power without any extra circuit or components, it gives the reading straight away. Easy to use, and is a good company with roboti..